The jet lag is wearing off, but we've still been needing a nap every afternoon - especially Ted who has been working in two languages, translating for me and trying to understand all the important information we're being given. We have an excellent host in Valeriy (val-AIR-ee), Ted's Kalmyk friend from a previous visit. Valeriy is a professor of philosophy at Kalmyk State University and seems to know everybody in town. He has been very generous with his time, driving us all over Elista (a small city), helping us get set up with phone SIM cards, taking us grocery shopping, introducing us to people at the university, etc. He's about a foot shorter than Ted and walks twice as fast - a busy man! Upon our arrival, Valeriy took us to his house, where his wife and mother had cooked us an amazing meal of plov (pilaf) and dumplings, compote (juice) made from berries his mother picked on the outskirts of the city, and Kalmyk tea (a milky, salty, buttery tea that I think is an acquired taste...). I hardly know what to write about since so much has happened since we arrived! I feel that I can sympathize just the tiniest bit with the refugees, immigrants, and international students who come to the U.S. in that it has been a confusing, exhausting, and sometimes even scary experience "moving" to this unfamiliar land with its unfamiliar language and customs. Today, for example, Ted and I were required to get our blood drawn and chests x-rayed in order to qualify for the local health insurance (recommended by the Fulbright office). 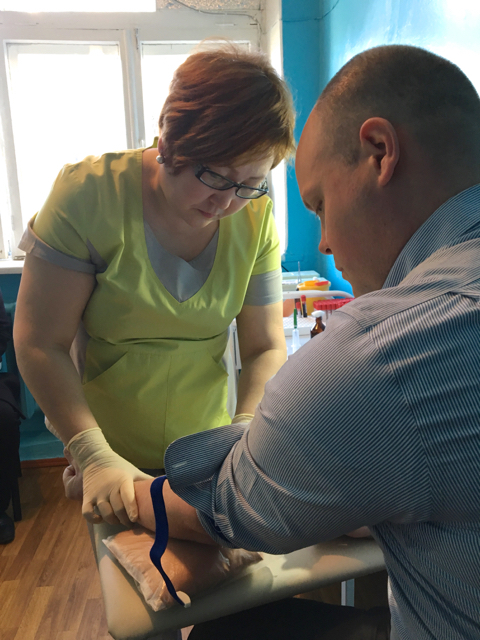 We first went to the free clinic to get our blood drawn - a scary prospect knowing that we'd be stuck with needles! Upon entering the building, we stepped into a long hallway lined on one side with benches full to capacity of people waiting to see the doctor. We were soon ushered into a small room where two nurses quickly sat us down on a bench and instructed us to roll up our sleeves. There wasn't time to freak out until the needle was already in our vein, but everything was clean and fresh - don't worry. Once the blood was drawn, we were told to hold a cotton ball against the puncture site and bend our elbow - not too unlike the U.S. except that we were given no band-aid to hold the cotton ball in place. Instead, we were required to deposit the cotton ball in a waste bin before leaving. 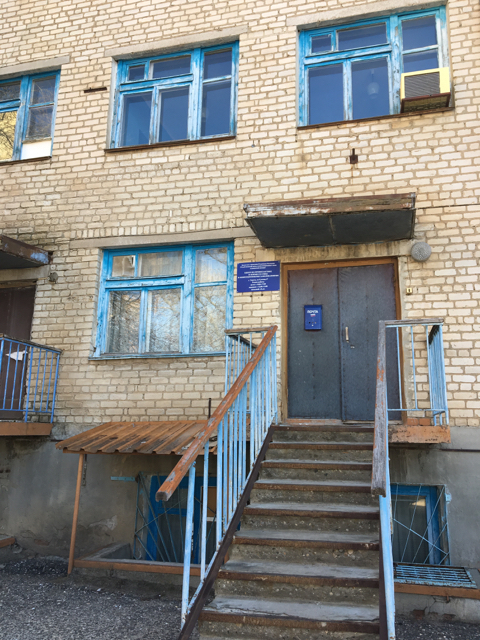 Apparently there is a half a million ruble fine for taking that little cotton ball out of the building because it is tainted with blood. After that we walked to the next clinic where we would have our chests x-rayed to check for tuberculosis. Valeriy says professors at the university have to do this every year in order to keep their job because they interact with students. The second clinic was more like an American hospital, though there were some differences. 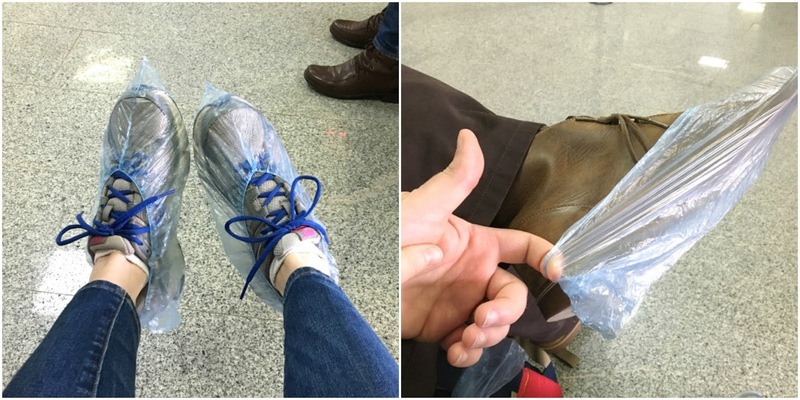 Patients have to wear little plastic booties on their shoes, for instance, except that Ted couldn't get them over his giant feet! When you check in at this hospital you are given a card - like a hotel key card - that opens a little turnstile gate leading to the area of the hospital you are visiting. You have to check your coat with a woman at the coat check before going into your designated area (coat checks are seen in many places around here, including the Buddhist temple). 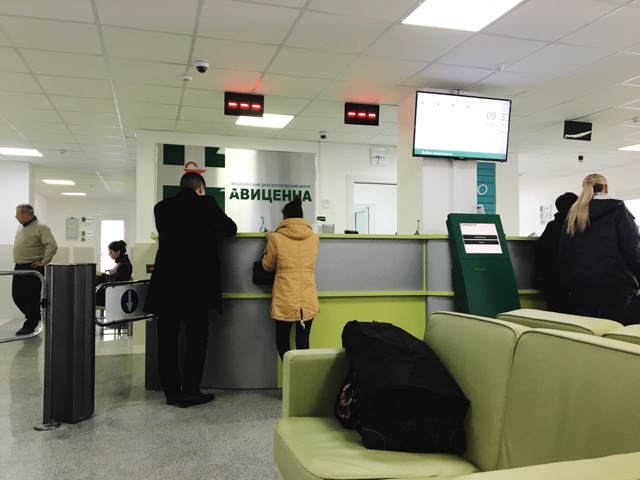 Don't be fooled by the DMV-style number machine and signs - everyone just pushes to the front to check in. When it was my turn to be x-rayed, I was told by the male technician to undress my top half and put my hair up (Ted was not allowed in the room with me to translate, so this was communicated to me through miming). There are no robes for privacy, just bare top. 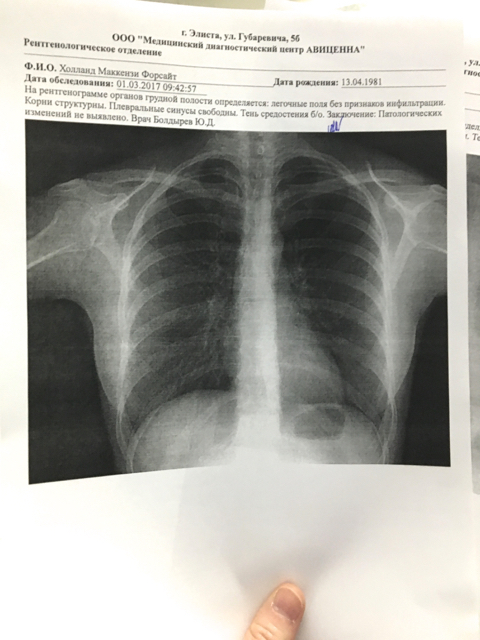 The x-ray itself took only a moment, and I was given a print-out of my lungs and an all-clear a few minutes later. It was all very quick and smooth (we had a chaperone from the university's international office to guide us through all this) and mostly painless, but it was a little overwhelming nonetheless. We didn't understand why we had to go through this - especially since Ted had a full physical in the U.S. as a Fulbright requirement - and medical facilities operate just a little bit differently here than we're used to. [Ted's Note: There's a trust-but-verify mentality here; for example, if our blood test turned up positive for certain diseases we'd have to leave the country right away. The U.S. has the same policy.] I couldn't help think about how scary it must be for immigrants who don't have an advocate or chaperone to hold their hand, so to speak. You really have to put your trust in the people who are poking, prodding, and x-raying you! So that was just over an hour of our day. There's simply too much to write about in one post, so look for more updates later in the week! Brave Mackenzie- keep them coming! Nice chest. X-ray. You are a trooper. After this you can do anything.